What advantages of fiber metal laser marking machine for ring? For the purpose of remembrance, people like to mark symbols on the surface of ring. as a ring marking laser machine manufacturer, we suggest that the fiber metal laser marking machine is a good choice for this work. 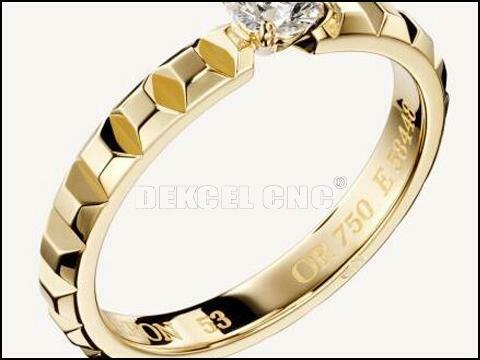 So what advantages of fiber metal laser marking machine for ring? This article, Jinan Dekcel Cnc Equipment Company will introduce for you. 1. Generally speaking, the materials of ring are metal, however, cnc fiber laser marking machine is suitable for mark metal materials. And The light of the semiconductor laser marking machine is irregular, so it can form multiple focus points. 2. The marking speed of cnc laser marking machine is fast. Using high speed metal ring marking machine to mark ring is very fast, it only takes more than ten seconds. 3. In addition, the laser spot is very small, and the effect of heat is also very small. So the symbol made by high precision laser marking machine is very perfect. So if you are interested in our metal laser marking machine for ring, or have any question about the cnc laser marking machine, please contact Jinan Dekcel Cnc Equipment Company. We are support service 24 hours online.